No scarf’s or loose clothing of any kind. Loose clothing can become hazardous if it gets tangled in low hanging branches or thorn vines. To keep warm and dry on windy, wintery rides, many Snowmobilers layer their clothing. Fleece, microfiber and other polyester fabrics are great options for layering under outer garments. Be careful not to wear cotton as a base layer; instead of wicking away perspiration, cotton will soak it up and stay wet. This includes cotton underwear and jeans against your skin. With hands exposed to wind and cold, and so far away from your core body heat, wearing gloves when Snowmobile riding is mandatory. Many Snowmobilers prefer the warmth and comfort of mittens, while other like the dexterity of a glove for using keys and picking up small objects. Typically Snowmobile gloves will extend beyond wrists to provide additional air tight protection. Wear waterproof/wind proof clothing when snowmobiling. If your clothing gets wet, water resistant material keeps you dry for about 30 minutes. After 30 minutes, moisture will soak through. Snowmobile bibs protect your legs and extend up to your chest area. Fit is important, and can be tricky. If you can, try them on at a dealer that sells snowmobiling clothing. Online Snowmobile bib options are more abundant, but make sure they are easily returnable just in case. Since many Snowmobile bib brands offer their own sizing charts with average/general measurements, before you shop measure your waist, hips and leg length accurately. Ideally, you may want another person to measure you. 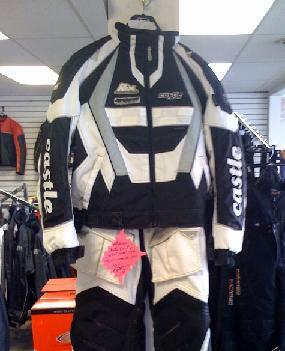 Choosing which Snowmobile jacket to purchase can be confusing due to the number of choices available. Warmth and comfort is paramount, so is what you wear underneath (refer to layering above). When choosing your Snowmobile jacket, you may want to consider how low the temperatures will drop to in the areas where you will be spending most of your time snowmobiling, and how active your riding style is. Snowmobile boots are another important clothing decision. Although similar in design for both men and women there are differences to consider when buying Snowmobile boots. What is their coldness rating? Is the liner removable? Do they lace up or close with Velcro? Most Snowmobile boots are pliable for comfort, although Snowmobile racers typically preferred a stiff style Snowmobile boot. When trying on Snowmobile boots at a dealer or retailer, it’s a good idea to try on the boots while wearing the socks you plan to wear inside the boots. What other clothing items should we have included?